The Moab Section of the Kokopelli trail begins at the junction of the La Sal Loop Road and the Gateway Road and ends down in the town of Moab. 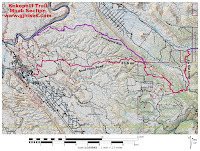 The first 6.3 miles of this section of the Kokopelli trail follows the La Sal Loop Road up to the point where it is crossed by the Whole Enchilada trail.The Whole Enchilada and Kokopelli trails share routes for just under 2 miles before going their separate ways. The Kokopelli trail continues for a little over 1 mile once the Whole Enchilada breaks off to where it comes out onto the Sand Flats Road which makes up the last 14 miles of its distance. Some mountain bikers opt to branch off on the Whole Enchilada and finish up with the Porcupine Rim trail rather than the Sand Flats Road. This is the same point where we left off with the Onion Creek Section of the Kokopelli trail. Measuring from where we began near Loma, Colorado this is the 118.6 mile point of the Kokopelli trail. Normally this 6.3 mile stretch of the La Sal Loop Road is paved but this just happened to be the year that they decided to widen the road and do a major reconstruction. The climbing elevation comes out to 2,175 feet that is spread out for 6 miles with a 7% grade that remains almost constant. There was actually a short stretch of pavement that was left intact that came up at the 3 mile point where the road flattens out a bit as it courses by the turnoff to Miners Basin. From there the road starts climbing again. As it continues the Jimmy Keen trail branches off on the right and a little further along the turnoff to the Mason Draw Campground comes up on the left. 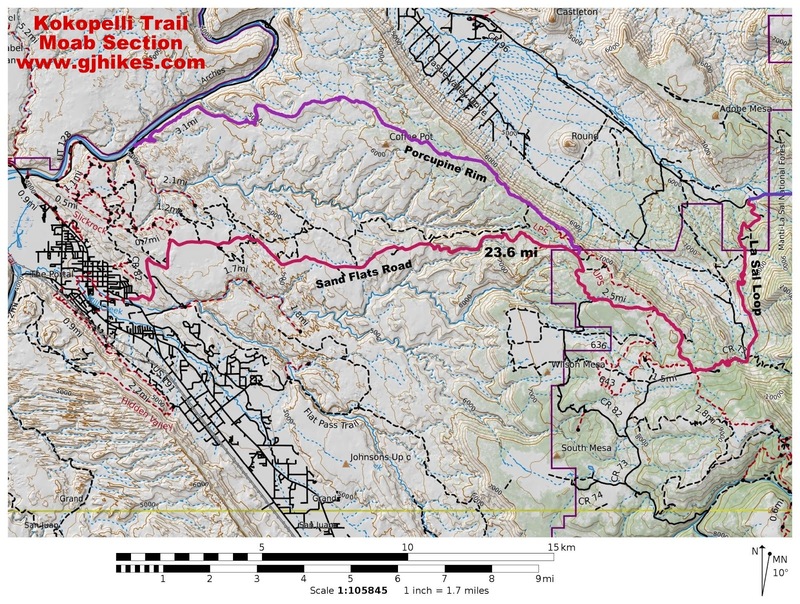 The next 3 miles of the Kokopelli trail follows a rough double track that courses through oakbrush for most of the time. It is connected to by the Jimmy Keen trail 3 more times during the first couple miles. There is one short section where the trail picks up almost 60 feet of elevation. Off to the right of the trail there are some nice views of the Priest and Nuns formation down in Castle Valley. At the 1.86 mile point from the La Sal Loop Road the Jimmy Keen trail comes in on the left and the UPS (Upper Porcupine Singletrack) trail branches off on the right taking the Whole Enchilada with it. The Kokopelli trail continues with some stretches of loose rocks followed by a large area of slickrock that transitions to some rutty dirt track that brings it to the Sand Flats Road. The road courses through a few tall ponderosa pines with several scenic rocky sandstone outcrops that make up a pleasant area to travel through. The road itself has a very powdery surface through here that is immediately noticeable if any vehicles happen by. As a matter of fact, a dust mask can come in handy on a busy day. As the trail leaves the Manti-La Sal National Forest behind it enters the BLM's Sand Flats Recreation Area. It is also at this point that the LPS (Lower Porcupine Singletrack) trail branches off on the right. For the next few miles the trail descends along the side of a deep red rock canyon. The elevation drops off rapidly until the road makes a short climb that takes it up to a ridge where the Porcupine Rim trail begins on the right. The Sand Flats Road gets scenic once again as it passes through the Fins-n-Things area where traffic can get pretty heavy at times creating lots of dust to deal with. The graveled road transitions to pavement as it breaks over a hill and passes by the famous Slick Rock Mountain Bike trail area. We ended this section of the Kokopelli trail at the junction of the Sand Flats Road and Mill Creek Drive. Some groups that are doing the Kokopelli trail without the aid of a support vehicle will leave a vehicle parked at the Moab Information Center just off of Main Street on East Center Street which is right at 1 mile from this point. The Moab Section of the Kokopelli trail is a nice finish to the 142 mile trek that began at Loma, Colorado. We broke the entire trail down into 7 segments to better describe it although we only spent 6 days actually riding it. From what we have gathered most people ride it in 4 days and we have heard of those that have done it in only 3. We also know of someone that would spend a week every year taking a group of Boy Scouts over the trail. Whether you have a support vehicle to haul your gear like we did, or choose to bikepack the whole thing, or hire a guide service to set up and stock your camps for you, the Kokopelli trail is a real adventure. If you would like to see it for yourself then all you have to do is 'Take a hike'.